Why a Spring Service Inspection is the right choice. Ensure your Compact Utility Tractor or Gator Utility Vehicle is in tip-top shape so it can perform at its best, when you need it the most. By keeping it in good running condition, you'll protect your equipment investment and minimize the risk of downtime or costly repairs, as well as maximizing your resale value. Save yourself time and money by taking advantage of our Spring Service Inspections and gain more update, less downtime. Ask for pricing on additional models and removing or installing attachments. For John Deere Gator UTV & XUV Utility Vehicles. 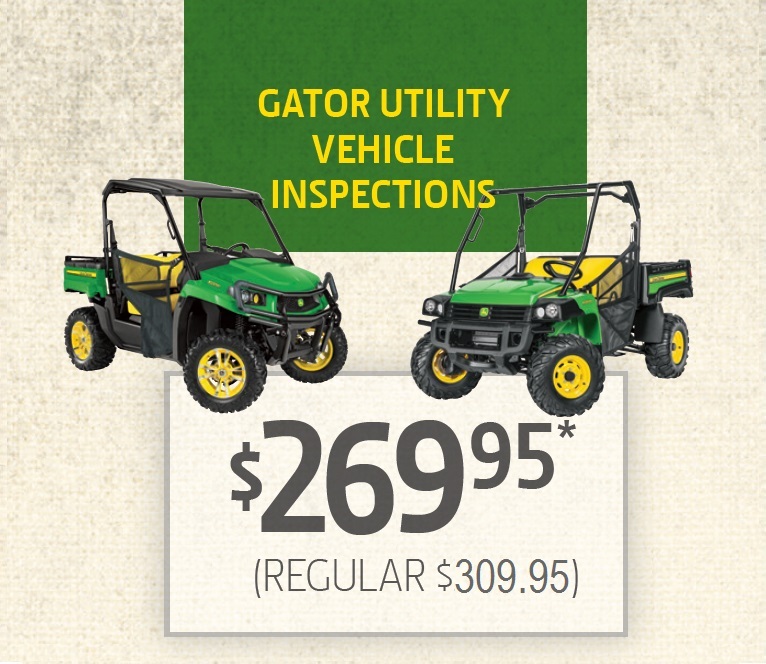 For John Deere Gator RSX Utility Vehicles. Service includes engine oil change and filter. Inspection includes checking charging system, battery connections, brakes, drive chains, tires and testing overall operation. 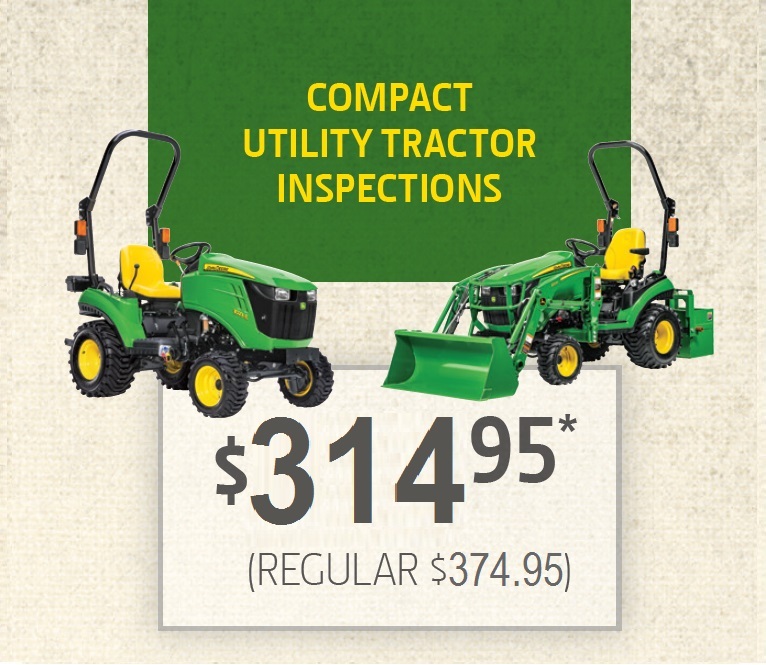 For John Deere 1- & 2-Series Compact Utility Tractors. For John Deere 3- & 4-Series Compact Utility Tractors. For John Deere 5E-Series Utility Tractors. Service includes engine oil change and filter. Inspection includes checking fuel system, hydraulics, transmission, steering, brakes, electrical & more. Upon completion of the inspection, you will be called with an estimate for any additional parts or repairs required to complete your machine tune-up. No surprises. Labour and regular inspection parts included. Additional parts may be extra. All work to be completed in shop. Taxes, pickup and delivery charges are not included. Attachments and implements are sold separately. Prices are subject to change without notice at any time.